The Electro Spinner, called Spana (スパナ ) in Japan, is an enemy robot found in the video game Sonic Adventure and subsequent games in the Sonic the Hedgehog series. Due to inconsistent English language localization, it also goes by the name Thunder Spinner. The Electro Spinner is a variant of the Bladed Spinner enemy. It is capable of defending itself with an electrical barrier that prevents players from attacking it with a Homing Attack. In Sonic Adventure, it looks identical to a regular Spinner. In this game, they are now known as Thunder Spinner, but retaining its original name Spana (スパナ ) in Japan. 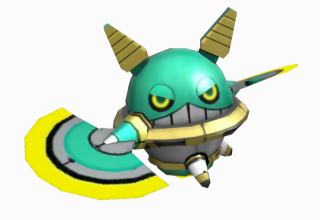 From Sonic Unleashed onward, they have been given a turquoise color to make them distinguishable from regular Spinners while also adopting the less menacing redesign the Spinners have been given. “ Think of these like a normal Spinner and you'll be in for a world of hurt when it discharges a jolt of electricity your way. Sliver/Plated Spinners cannot be destroyed. Prism Spinners disappear and reappear. In the HD versions of Sonic Generations, the Electro Spinner reappears in Speed ​​Highway, Seaside Hill (replacing the Flappers of the original Seaside Hill) and Rooftop Run. They have the same design and attack pattern as in Sonic Colors. In the Nintendo 3DS version of Sonic Lost World, Electro Spinners can be found throughout most of the stages, namely in Windy Hill, Frozen Factory, Silent Forest and Sky Road. They retain their attack pattern from past appearances. This page was last edited on 18 January 2019, at 13:58.